My name is Markus and I was born 15th of December 1985 in Kemijärvi as the lastborn. I have two older sisters. I lived in Kemijärvi for 20 years until I moved to Oulu where I am currently living. Music came in to my life quite early, when I was 12 years old. To be perfectly honest, music got to me by surprise! I have always been artistic and I attended to school of visual arts for 6 years when I was younger. I really loved drawing and painting, but when I got my first guitar music made a home in my heart and is still there, quite strong! I remember me having an idea that I could be a guitarist too like my maternal uncle! My mom and grandmom were pretty sceptic about it since kids get ideas and they usually forget them as fast. 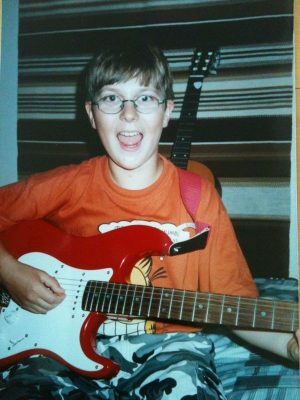 But I held my head and finally my mom and grandmom, after saving money for a long time, bought me my first guitar (which I still own). I was the happiest kid. I composed my first songs pretty much right away as I learned to play a bit. There was no fancy equipment back then like there is now but I was fine with a cassette deck! I just plugged my guitar and went for it. That’s how I got my first glimpse on making music. This is me with my first love back in -97. When it comes to musical influences, Metallica was my first touch in metal music. I practised everyday and I knew how to play every Metallica song. I practised until my fingers started to bleed. I have always been determined and once I start something, it is quite impossible to stop until it is done. I think that is the main reason why Mournful Lines came in to my life. I have been dreaming about being a rock star for as long as I can remember. 20 years and counting to be precise! 😀 I remember when I saw Metallica live back in 2004 in Helsinki and that had a huge impact on my musical influences. I have always been the “strange kid” at school and pretty much everywhere. For example all the kids at my school were listening to 90’s pop which was the “coolest”. I listened to Metallica and other metal bands and always wore black. Maybe that’s the reason I was bullied A LOT through my school years. Difference is a flame to bullies. Bullying changed me as a person and maybe that is a good thing in a way? Without those experiences Mournful Lines wouldn’t exist. I had my first band in college with my friends called Tears of Despair (quite happy, eh?). We did a few shows (a few meaning 3). I had a total of two bands when I was living in Kemijärvi. Takorauta was one of them (Rock music with Finnish lyrics). The band actually still exists, though the line-up is totally different now. I had a break from band activities when I moved to Oulu 2006. I formed Wintery in 2007 that changed name to Earthlinger and played for a couple of years. After quite bad experiences with some members of Earthlinger I started to hate myself as a guitarist and as a composer and whatnot. I pretty much hated my life altogether back then and that forced me to quit making music for two whole years! When I got myself back on track in 2011 I had the feeling I am strong enough to start playing again. I formed Menial. I still was missing something in my heart, something I couldn’t describe. I loved playing and all, but I think the musical style I was heading in to wasn’t my thing. I was asked to be a guitarist for a local band Zerocrowd in 2012 and I agreed. 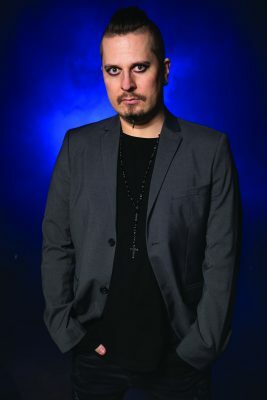 At the end of the year 2012 I wanted to make music that I have always loved – gothic rock and metal. It is quite funny I grew up listening to gothic metal (HIM, The 69 Eyes, To/Die/For, For my pain etc.) though my initial touch to metal was Metallica. I wanted to create music that is easy to listen, simple rock music and the most important thing, with clean vocals. That’s when Mournful Lines was born. I quit my job with Zerocrowd and Menial so that I can put all my effort and energy in Mournful Lines. There has never been a doubt in my mind whether I did the right thing or not. 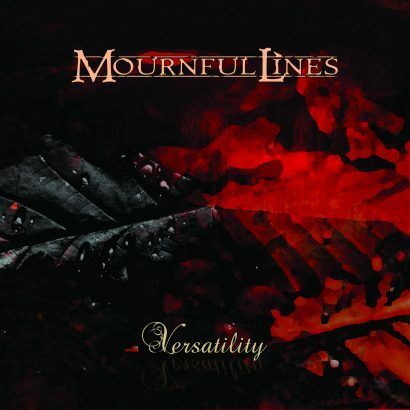 I love the guys on Mournful Lines and though I haven’t said that out loud, I know that they know! Without them, Mournful Lines wouldn’t be what it is today. Favourite Mournful Lines song(s): They are all my children so I love them equally! Influences: Trivium, HIM, Stam1na (top3), but there are so many great bands out there that affects me both emotionally and musically. I grew up listening to gothinc metal.